In his classic independent film NIGHT ON EARTH Jim Jarmusch took us on a ride in a taxi in five different cities – Los Angeles, New York, Paris, Rome, and Helsinki. 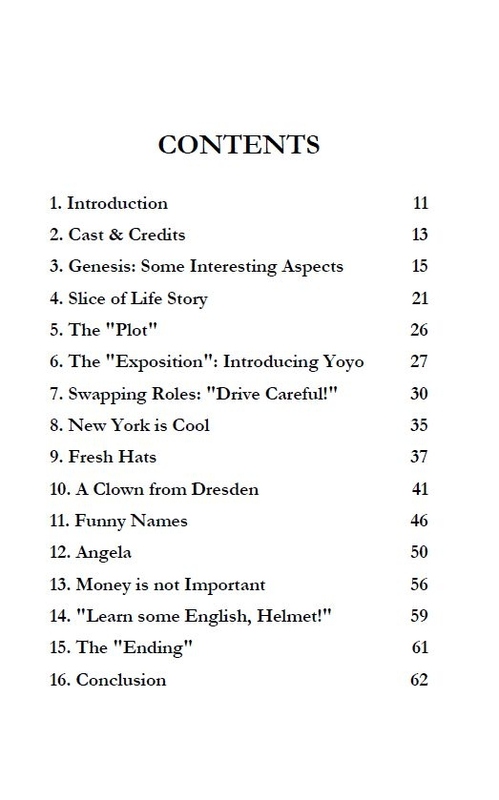 In the present handy volume, acclaimed author Bernd Wahlbrinck presents an in-depth analysis of the New York episode. After the moderate success of NICHT ZU FASSEN – an anthology actually consisting of 26 German and 10 English reviews of non-existing books (!) 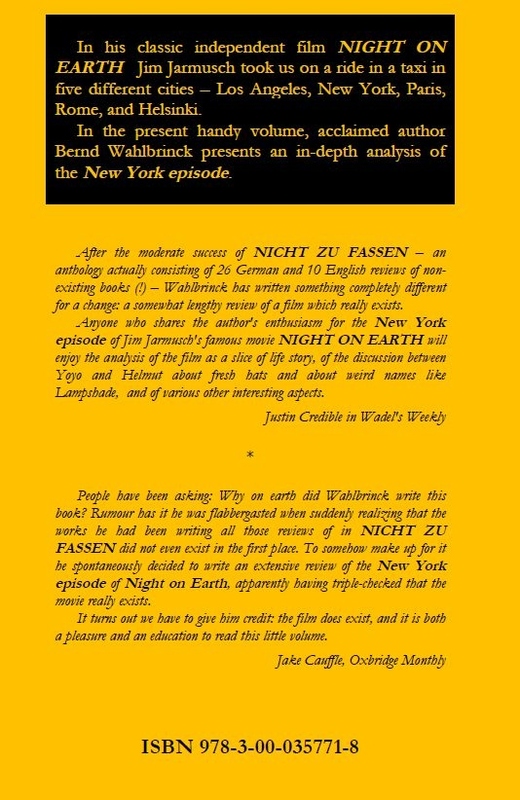 – Wahlbrinck has written something completely different for a change: a somewhat lengthy review of a film which really exists. 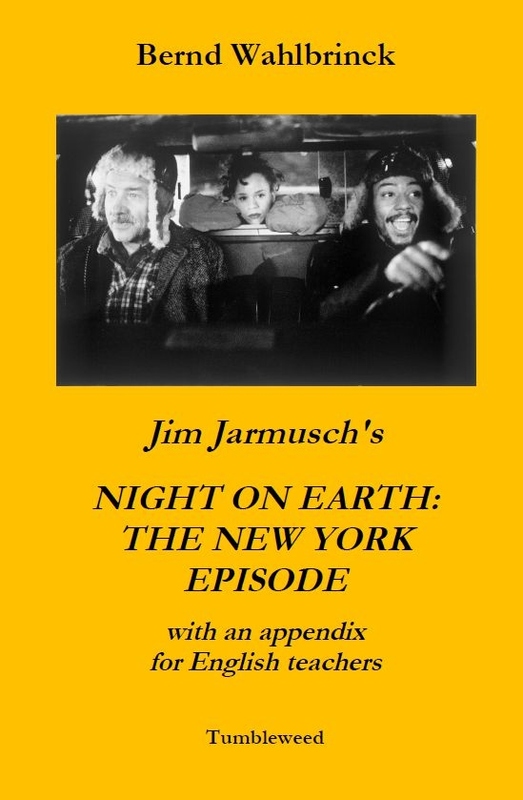 Anyone who shares the author's enthusiasm for the New York episode of Jim Jarmusch's famous movie NIGHT ON EARTH will enjoy the analysis of the film as a slice of life story, of the discussion between Yoyo and Helmut about fresh hats and about weird names like Lampshade, and of various other interesting aspects. People have been asking: Why on earth did Wahlbrinck write this book? Rumour has it he was flabbergasted when suddenly realizing that the works he had been writing all those reviews of in NICHT ZU FASSEN did not even exist in the first place. To somehow make up for it he spontaneously decided to write an extensive review of the New York episode of Night on Earth, apparently having triple-checked that the movie really exists. It turns out we have to give him credit: the film does exist, and it is both a pleasure and an education to read this little volume. 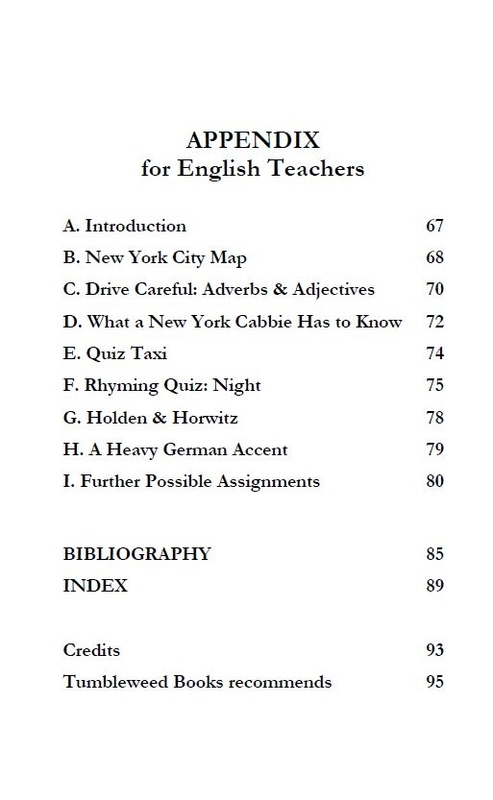 NOTE: This book is also available as an economically priced pdf file which can be sent via email attachment. Of course, a pdf file does not give you the pleasure of holding a real book in your hands. Then again, it does have advantages - e.g. you can print out the worksheets in the appendix section. Also, you can directly click on all the internet links. © 2016 by Bernd Wahlbrinck, Home of the Wadel, Germany. This work /website, in its entirety, is protected under the copyright laws of the Federal Republic of Germany. No part or portion of the contents of this site can be reproduced without written permission of the author.